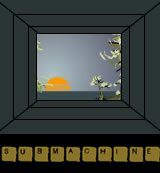 Submachine - point'n'click game by Mateusz skutnik. Click on doors to move between rooms. search for and collect items. some of them you can use again by clicking and dragging onto the game screen, others you can only look at. try to find four tiles of the puzzle to get out. good luck.